Whether you're going away for the weekend or setting off on an extended vacation, this generously sized LeSportsac bag will offer you plenty of storage space for travel essentials. 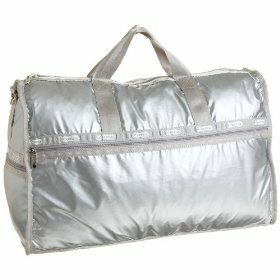 Like nearly all handbags from LeSportsac, this large weekender is made from the brand's signature ripstop nylon fabric. Although I don't think the durable material is always necessary for small shoulder bags or messengers that don't get a lot of wear and tear, I can definitely see the benefit to such a practical fabric on a travel tote. This shiny metallic silver is not your only option for color. The Large Weekender also comes in some of LeSportsac's more well-known prints in florals and one very fun zebra pattern. You won't have any trouble lugging your stuff around in this handbag due to its detachable, adjustable strap. It's a nice feature when you've got several pieces of luggage to haul around an airport. With tons of zippered compartments and an extra pouch to boot, the LeSportsac Large Weekender is convenience with style.